Several coworkers and I had a farewell lunch at El Camino Mongolian BBQ for lunch today! This place is owned and run by a Korean couple; check out their story! Mongolian barbecue first appeared in Taiwan in the middle to late 20th century. Although the stir-frying of meats on a large, open surface is supposed to evoke Mongolian cuisine, the preparation actually derives from Japanese-style teppanyaki which was popular in Taiwan at the time. “Mongolian” barbecue is not actually Mongolian at all; for examples of genuine Mongolian food, see buuz or khuushuur. A barbecue in Mongolia is prepared quite differently. Notwithstanding the historic facts, American restaurants such as HuHot Mongolian Grill and BD’s Mongolian Barbeque claim that soldiers of the Mongol Empire gathered large quantities of meats, prepared them with their swords and cooked them on their overturned shields over a large fire, while a German restaurant chain with the same concept claims that the Mongolian soldiers cooked their meals on a heated stone. Typically, diners choose various ingredients from a buffet of thinly sliced raw meats (beef, pork, lamb, turkey, chicken, shrimp) and vegetables (cabbage, tofu, sliced onion, cilantro, broccoli, and mushrooms) and assemble them in a large bowl or on a plate. These ingredients are given to the griddle operator who adds the diner’s choice of sauce and transfers them to one section of the hot griddle. Oil and sometimes water may be added to ease cooking, and the ingredients are stirred occasionally. 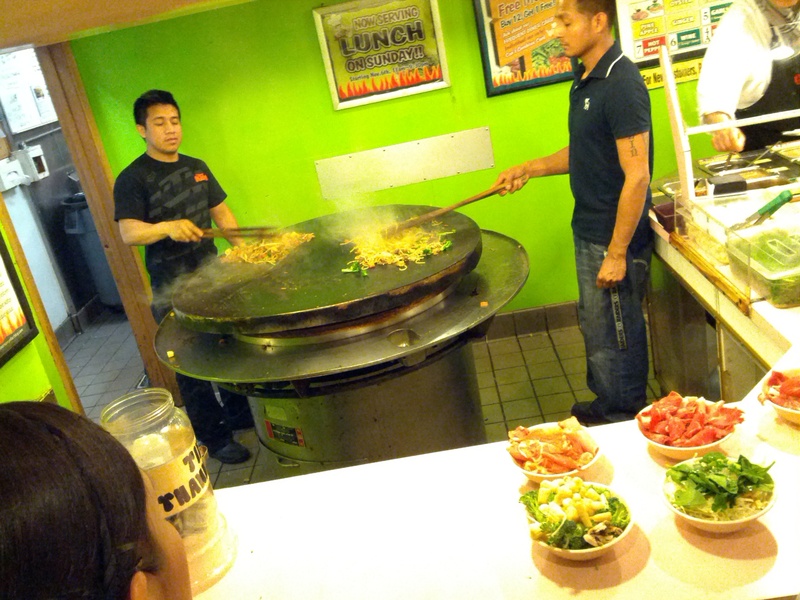 The ample size of the Mongolian barbecue griddle allows for several diners’ food to be cooked simultaneously on different parts of the griddle. In many restaurants (primarily buffets) one dish will be cooked at a time, the operator walking around the outside of the grill once or twice moving the food while walking. When cooking is complete, the finished dish is scooped into a bowl and handed to the diner.